Start the software, click the 'Purchase' button, and follow the instructions to order online. This is a popular way to purchase. Try before you buy. Then use the software's 'Purchase' button to order. See Start the Software and Purchase below. You can purchase now and receive an unlock key. Enter the unlock key to unlock the software. Registered users of Book Writer can upgrade to Writer's Desk at a reduced price. Install the software: Using Windows Explorer, find the file you downloaded and double-click it. Click on 'Purchase' on the start-up screen. Or choose 'Purchase/Unlock' on the Main Menu | Help submenu..
You will see options to purchase online or by phone. Your browser will open up an order form on a secure site. 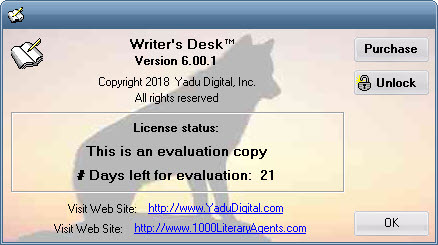 (https://www.yadudigital.com). Fill out the order form, review your entries, and click 'Purchase' to complete your registration. You will receive an unlock key. All information is strictly confidential and secure. We do not keep your credit card or PayPal information. Shortly after giving your purchase information, you will receive an unlock key. Unlock the software by entering your unlock key. See How to Unlock. Whether you pay by credit card or by online check, all your order information is processed on a secure server and encrypted before transmission over the Internet. Your account number, name, e-mail address, as well as all other items of information, are encrypted so that only authorized parties can read them. In computer talk, this security is accomplished by TLS (Transport Layer Security, stronger than the outdated SSL).